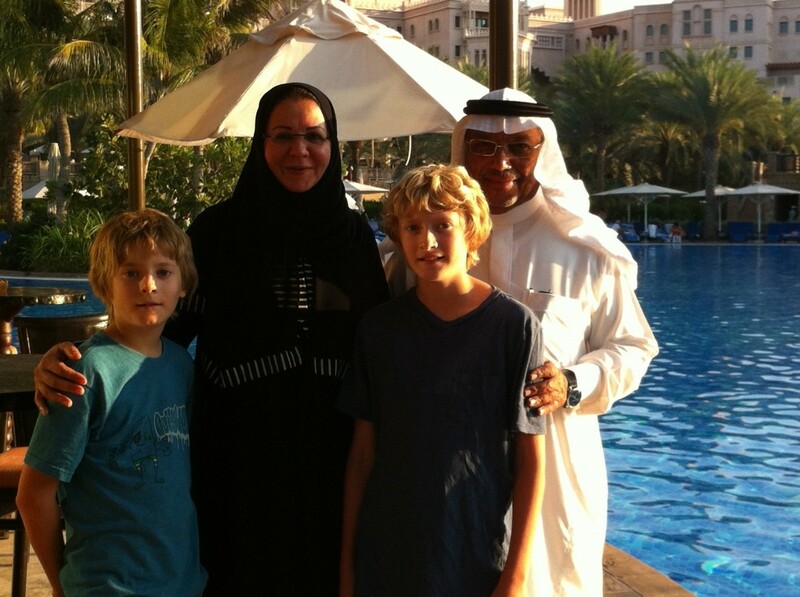 We were delighted to see Omar and Nadia yesterday. They took us to lunch at the Dar Al Masyaf Hotel, a Venice-themed luxury resort in Dubai. Wow. The hotel transported us via boat through their canal system and past $25,000 per night villas to a beautiful poolside restaurant. After a nice lunch and some reminiscing, the Mashabis took us to the Mall of the Emirates, where we had a gander at the indoor ski slope. The new areas of Dubai are spectacular. Omar tells me that when he first came here in 2000 to work for the municipality of Dubai, there was only desert around the area we are staying in. Now, the skyline is world-famous and the place exudes luxury. We arrived at the tail end of their 41st celebration of National Day, the anniversary of the formation of the UAE in 1971, and banners and images of sheikhs still adorn the buildings and billboards. A brief recap of the country can be found here. Today, what most of us see is the beautiful architecture. However, there may be a darker side to all of the glitter. My friend Nick shared this article which includes some disturbing information. I can’t speak from my own observations and the author may not have all his facts straight, but it’s not hard to imagine that there is more to Dubai than meets the (casual) eye. Update: after Janell and I discussed my sense that this article didn’t ring true, she searched and found an article which discusses the author’s dismissal from his paper amid accusations of plagiarism and other journalistic misdeeds. So, we were right to read this with some skepticism, but I wonder if there weren’t some nuggets of truth in there too.